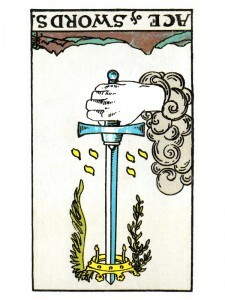 If you see the Ace of Swords (R), you may have difficulty with the early stages of formulating an idea, a plan or your goals. The confusion of too many ideas or the indecision of too few – creating trouble with completion. Your mental talents must fit the situation – see if you are too strong or too weak for the situation at hand. Sometimes, experiencing a negative is necessary in order to achieve something better – triggering the strength of your mind into action. Never use pressure to achieve your goals – check everything, look for any weak areas in your plans and make them carefully. Never be hasty – take the time to make sure everything is in its proper order and always remember that there are two sides to everything. Unabashed honesty at an unnecessary moment. Outright lies when truth is crucial. When your grip on reality fails – it brings with it illusion, overpowering emotions, confused ideas and mixed feelings. Without a clear sense of your reality – your mind can fall prey to mistakes created by these emotions. Problems become exaggerated and everything, including attractions – “appear” to be more important than they actually are. Take hold of yourself now – see through the illusions and find a balanced sense of your reality. What new problem are you confronting? What do you need to analyze? Are you being just and fair? What decision do you need to face? Can you determine the truth of the matter? What legal, writing or research opportunities have been presented to you? Next to World: You are reluctant to accept advice from others, you consider any help that is offered as interference and this obstinate attitude must be corrected. Next to Hierophant: Do not divide your concentration, set your sights on a specific goal – center all your energy on it and your life will improve. Next to Wheel of Fortune: Each turn seems to be a dead end, you are feeling like there is no way out. It is time to start again and do not be distracted from your goal. In the first position: Your life purpose will seem to be that of observer as you allow yourself and your energy to help get the message across to your fellow man. There are many lessons for you in learning how to perform this function well. While getting the message may come fairly easy, getting it across to others may prove to be a real task. In the second position: Shore up your abilities of mental leadership, originality, knowledge, communication and organization to secure your base of operations and to maximize the present potential. In the third position: Listen to what others may be telling you. Prepare for major message, for alignment of chakras must occur now for work ahead. Check immediate environment for message already visible but not yet discovered or internalized. May need to subordinate yourself more in present situations. In the fourth position: Too much mind in your emotional tapes, the love for order and discipline may be inordinate. In the fifth position: While you may be on target, adjustments for timing or incorporating the ideas, even the leadership of others may be necessary. Question of originality – be careful of plagiarism, distortion of the truth. Check new information, it may be incomplete or inaccurate. In the sixth position: New ideas, realizations may be incomplete or even faulty. You may have more information than is necessary or even appropriate for the situation at hand. In the seventh position: Fear intrudes as you realize, through what you have already learned – the immensity of what still lies ahead. Severe distortion of information can throw you off track. You may lack confidence or you may be foolishly overconfident. In the eighth position: Difficulty beginning or ending project – straighten up, stiffen your backbone, then get on with the program. In the ninth position: Gut feeling, subconscious may be either overly optimistic or unreasonably pessimistic. Instincts are either unreliable now or they are so certain, that they have taken over and you are virtually on automatic. In the tenth position: Allow new input to challenge you – routines must be examined and altered. You may be looking through the wrong end of the telescope. More may have been revealed than you would like; use your internal guidance to know what needs to be done and what will be done – starting now.